POS Integrations in Restaurant365 have been enabled to auto-import the Daily Sales after the daily close process has concluded at the restaurant locations. Typically the Auto-Import is scheduled to run around 2 am - 4 am local time. Depending upon your connection speed and how many transactions you had in your store this day, the upload process may take between 3-8 minutes. You will see a progress bar appear while the upload is taking place. You will know that it is complete when a web browser opens. 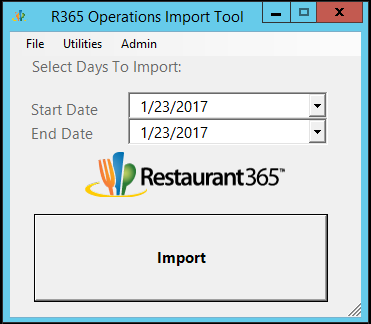 It may be necessary for you to log into Restaurant365 (not the import tool but rather the website.) This process has created the Daily Sales Summary (or DSS) record for the date selected for your location. Click ‘Next Step’ and the system opens the Deposit tab. In this step, count the cash, coin, and checks you have received. For cash, enter the number of each denomination you will be depositing. The system will total them for you. For coin, enter the total dollar amount you will be depositing for this day (if any). For checks, enter the total of all the checks or use the in-cell formula to add them up if you have more than one. The system will calculate the Total Deposit for you. The Over/Short amount is also calculated and if all is well, this over and short should be the same as reported in the daily closing report out of your POS system. Numerous POS Systems allow R365 to import Deposits 1, 2 and 3 directly from the POS System (if they have been entered there). When this function works on your POS, you'll notice the Deposit amounts being set automatically on this tab. The Auto-Import Tool will also perform a 'Deposit Lookback' for certain POS Systems. This will occur if a Deposit was entered after the initial DSS import on the POS System. The Auto-Import Tool will perform the Deposit Lookback and if a value is found, it will add the deposit value onto the respective Unapproved DSS record. If the Deposit value had already been manually entered, before the Deposit Lookback occurred, it will not overwrite the existing value. After completing the deposit, click ‘Next Step’ and the Exception tab opens. This tab will display all sales tickets that have a Payment Type that was flagged as an exception. The details of each sales ticket and the server are displayed. For each ticket, the user can select and assign an employee to the exception. For example, if it was an employee meal, select the employee who consumed the meal. If the exception was the result of meal preparation error, select the name of the cook responsible. The final step is to type in a free-text reason for each exception. You have just completed your digital ‘Exception Log Book’. Once you have completed the exceptions tab, click ‘Next Step’ and the House Accounts tab opens. Listed are the sales tickets that were flagged as House Accounts in the POS. Restaurant365 will attempt to match the record with the customer in Restaurant365. If a match is not found, you will need to select it from the drop down. This will be used to bill the customer. If you don’t see the customer in the drop down list, select ‘Need to add Customer’. Then make a note of the customer in the comments above. Click ‘Next Step’ and the Paid Out tab will appear. Displayed are each of the recorded ‘Paid Outs’ for the day from the POS system along with any description that was entered in the POS. For each Paid Out, you will assign the proper cost category by selecting the GL Account. Note: For users with the security role of Restaurant Manager, to be able to select and assign the correct GL Account, that account must have been marked as 'Available to Managers' on the GL Account Record. Begin by typing in the name of the GL Account and select the correct account where the cost will be recorded. Repeat the process for each Paid Out, then when you are complete, click Next Step to proceed to Labor Review. After completing the Paidouts tab, Click ‘Next Step’ and the Labor tab will appear. Review labor entries for the day and correct discrepancies in the POS and re-import as needed. After validating the Labor tab, click on 'Next Step'. If the 'Next Step' button has been replaced with 'Steps Complete', this is because reviewing the Journal Entry is not required for your User. The final tab (if it is necessary for you to review it) is the Journal Entry Tab. Make sure the JE is in balance and all lines have a GL Account assigned in the 'Account' column. Once complete click on 'Steps Complete' to Save the Daily Sales Summary.